Amy Fradon, formerly of the popular duo Amy Fradon and Leslie Ritter, has been singing and performing here and abroad in a wide array of musical groups for the past 25 years. Amy grew up in a family of artists: her father. Dana Fradon was an extremely successful New Yorker cartoonist and her mother, Ramona Fradon, known as the "Queen of Comics" was one of the two first women artists to break into mainstream comic book illustration. Amy's dad would get her to play and sing the old standards of his childhood with him when she was a child and Amy always joined her school chorus and theatre/dance groups. Amy had thought she would be a dancer but when she was about 19, she heard the singer Valerie Carter belt out a long, amazing note and reports that she broke down in tears and "knew" she had to pursue singing. This "knowing" took her to all sorts of musical adventures and life-changing experiences that would pave the way to all she does and loves today. Amy quit her dance studies at NYU to move to Woodstock where she had been invited to join a band. She rapidly got immersed in the music scene of the early 80's in Woodstock with the help and encouragement of veteran musicians such as Happy and Artie Traum, Robbie DuPree, Rick Danko and the Band, Ed Sanders and the Fugs, Tim Moore, Livingston Taylor and Orleans. She was a quick study and loved harmony and soon became an in demand backing vocalist and singer for jingles such as NJ tourism, Sheik Condoms and Gimbles Department store and many album projects. In 1982, Amy got into the national Touring Company of the Broadway hit, Pumpboys and Dinettes. After touring with three companies she hooked up with singer Leslie Ritter. Their magical harmony singing led them to two recording contracts with Alcazar Records (Amy and Leslie) and Shanachie Cachet (Take Me Home) where they garnered critical and radio acclaim. Amy and Leslie also worked with Kim Rosen and Cathie Malach in the Interspieces Connection bringing a therapeutic technique for self-transformation called the BRETHwork to people in conjunction with swimming with dolphins. Amy assisted Kim's work with voice support and group facilitation. She completed a three year certification with Kim called the Delphys Training in alternative counseling and healing modalities. It was during this time that Amy discovered her love of teaching and counseling work. 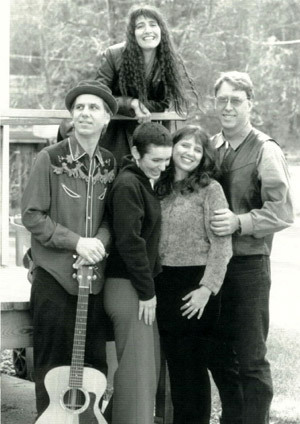 Amy went solo in 1994 and toured with her band, Small Town News for the next ten years. She recorded two critically acclaimed solo CDs called Passion Angel and Small Town News. She has played the Philly Folk Fest, the Bottom Line, the Towne Crier to name a few. During this time Amy developed a large private practice teaching vocal technique and helping people to find their "voice" using voice as a vehicle for self-discovery. Amy calls this work the Vocal Visionary Work and she leads workshops such as The Singing Body and Finding the Voice of the Feminine and has taught at and done concerts for such venues as Omega Institute, Southern Springs Holistic Center and SUNY Purchase. Amy has toured extensively as the female lead singer with the Vanaver Caravan in their delightful dance and music show about Woody Guthrie. Amy is also a member of Face the Music Face the Music bringing music as a team-building medium to the corporate world. They have clients such as Bank of America, Aventis, Pfizer, Aramark and General Electric. In 2007, Amy finished a three year course of study towards ordination and spiritual counseling certification at the The New Seminary for Interfaith Ministry. She is a fully ordained Interfaith Minister and performs weddings, funerals and other rites of passage with an emphasis on helping people to create truly meaningful, personal ceremonies. Amy also has a private practice in Spiritual Counseling and is finishing up a BA in Expressive Arts Counseling. She stills tours with her own music with guitarist Jim Barbaro and Amy and Leslie give concerts several times a year. Amy's Vocal Visionary students are beginning to give their community concerts in service to the greater local community and to the process of melding singing with spiritual practice and service.